I call my sister to see how she’s doing. The past few months have been rough between setting up a new household, shuffling kids back and forth, and dealing with all the emotional ups and downs of substantial change. And in spite of breaking two lamps in the move, countless hours on the phone and still no internet connection, a clogged vacuum from ridding the van of hay for the miniature pony, she is still being industrious—a family trait—and making homemade pesto from bunches of homegrown basil brought in earlier that day by a coworker. “I love pesto! Do you like pesto?” she gushes! I can practically hear her inhaling the basil as it is being blended with pine nuts and olive oil. I also hear the whir of the blender in the background. Ouch! “And pine nuts!” she continues. Whirrrrrrr-whirrrr! Double Ouch! Get creative with your pesto ingredients. Lemon juice and zest are a must for bright flavor and color! Pine nuts, however, I cannot so enthusiastically endorse. You see, the thought of pine nuts transports me back to a time years when a mysterious metallic taste in my mouth plagues me for weeks. At its worst when drinking my beloved hot coffee, nothing, absolutely nothing tastes good! I am sure I am destined to a life of disturbed taste buds. Payback for….what? So, doing what we all do when facing a question we don’t know the answer to, I Google. Within seconds I am one of them and have a new definition of PMS to boot: Pine Mouth Sufferers. “Damn You Pine Nuts” becomes my best new Facebook friend, home to tons of other folks who share my symptoms. Here I learn that pickle juice and hot sauce are palatable. I also learn that the Pine Nut, Pinus armandii, a smaller, duller, and more rounded variety than typical pine nuts is thought to be the culprit (a 2011 study in the Journal of Toxicology finds results consistent with this hypothesis). 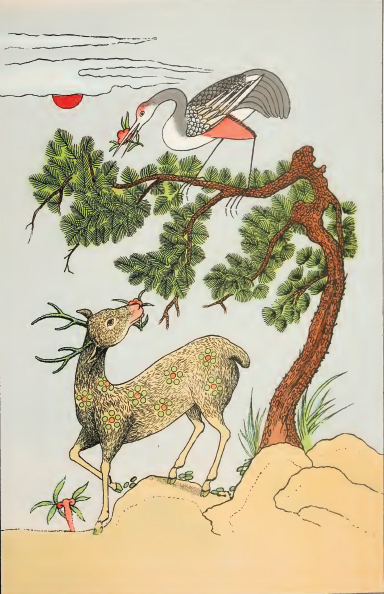 Chinese White Pine seeds are harvested and sold as pine nuts. These nuts are responsible for “Pine Mouth Syndrome”. Damn you pine nuts. Side note: Others suggest the aftertaste could be a difference in how people experience the nut (sort of like how some people’s genes make them prone to odoriferous pee after eating asparagus or some people’s genes allow them to detect the smell while others’ do not!?!). In any event, while I am not ready to endorse the pine nut anytime soon, I certainly don’t have the heart to douse my sister’s enthusiasm. Her industrious spirit inspires me to face the large pot of basil I grew from seed with some sort of plan. Heading to my Trader Joe’s after work, I buy olive oil and parmesan cheese and…not pine nuts, particularly after reading the new disclaimer on the package which warns: Some individuals may experience a reaction to eating pine nuts, characterized by a lingering bitter or metallic taste. Instead, I am drawn to the bag of comparably priced meaty macadamia nuts next to my metallic mouth nemesis. Macadamia nuts have a creamy texture and mild nutty base perfect for canvasing pesto flavors. Back up plan in place, I head home to begin my own whirring frenzy. 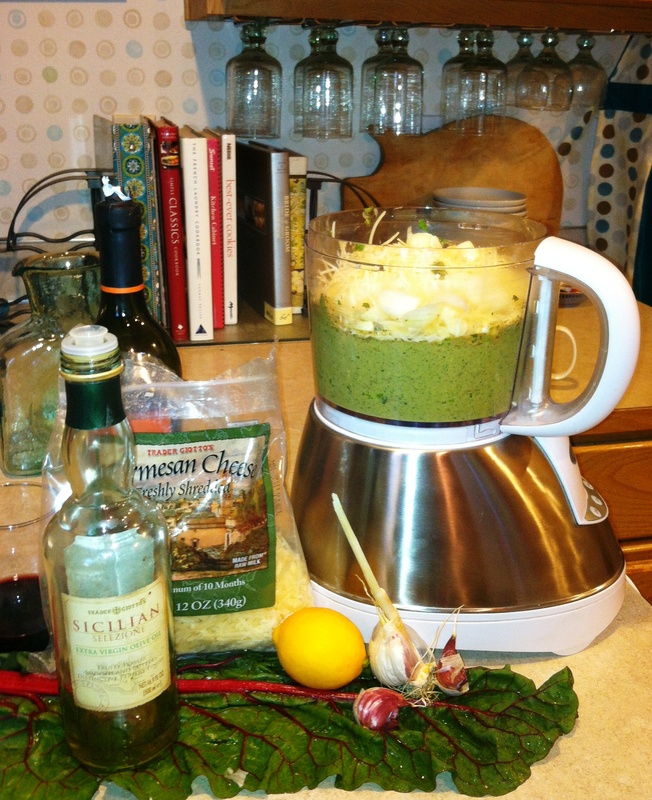 The fun thing about making pesto is that you don’t have to follow a recipe once you know the basic ingredients. It’s really about adding and adjusting to your taste and being creative in the process. Even so, I will share my approximate ratio of ingredients for this metallic free sister inspired batch. My on-hand Acme Farms and Kitchens Produce Box additions: Green leafy parts of two to three large Swiss Chard leaves (avoid red stemmed variety for color aesthetics), one plump shallot, one large Poblano pepper. With the exception of kosher salt, olive oil, and cheese, place all other ingredients in food processor. Slowly add oil while blending. Lastly, blend in cheese and add salt a teaspoon at a time, sampling until desired taste with all ingredients is reached. Great storage tip: Spray/coat ice-cube trays with canola or olive oil. 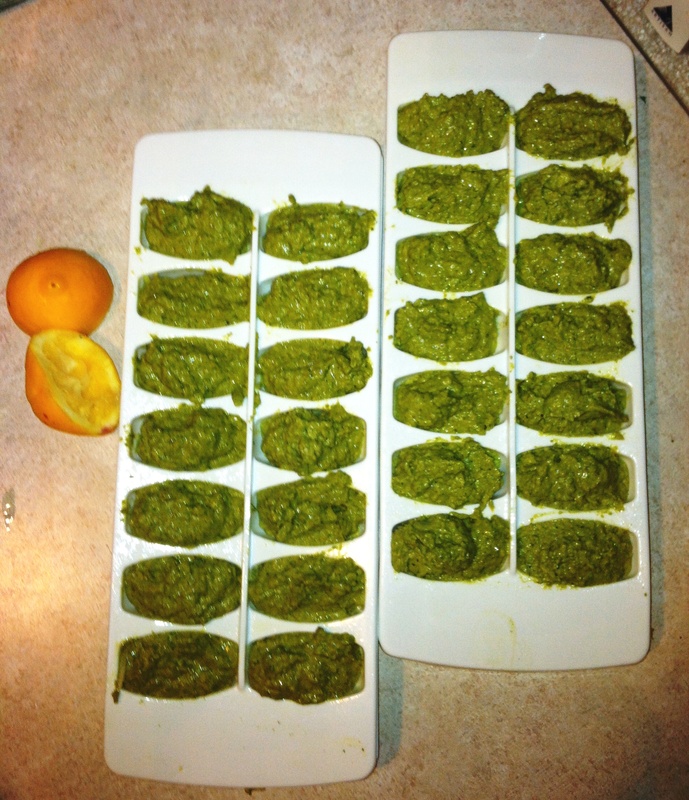 Spoon pesto into individual ice-cube wells and freeze. Once frozen, remove from tray, wrap individually in foil and place in a freezer bag and return to freezer. Remove a few cubes at a time, defrost, and add to hot steaming pasta for an easy and delicious pesto pasta dinner come winter. Pesto stores well in the freezer. Seal individual cubes in foil and freeze for useon pizza, pasta, bruschetta or in your favorite Quiche recipe come winter. Perhaps you have been lucky enough to find a reliable source of pine nuts that don’t leave a bad taste in your mouth–or maybe you are just genetically blessed. As for me, I’ll be playing it safe from now on. Once bitten, twice shy. I think my sister would agree. YUM!! !I would definitely try this. I’ve used walnuts in a pinch and macadamias or pistachios don’t scare me either :).